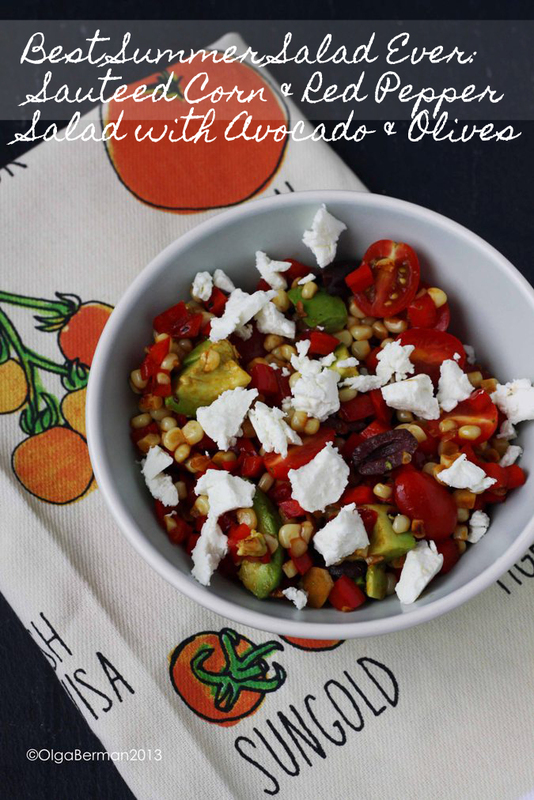 This Sauteed Corn & Red Pepper Salad with Avocado, Olives & Goat Cheese will quickly become your favorite summer salad or a side. The sweetness of the corn is balanced with the saltiness of the olives. Plus, what's not to like about the creamy avocado and the mild goat cheese? Not only is this recipe perfect for Meatless Monday, it is perfect for lunch or dinner any day of the week. 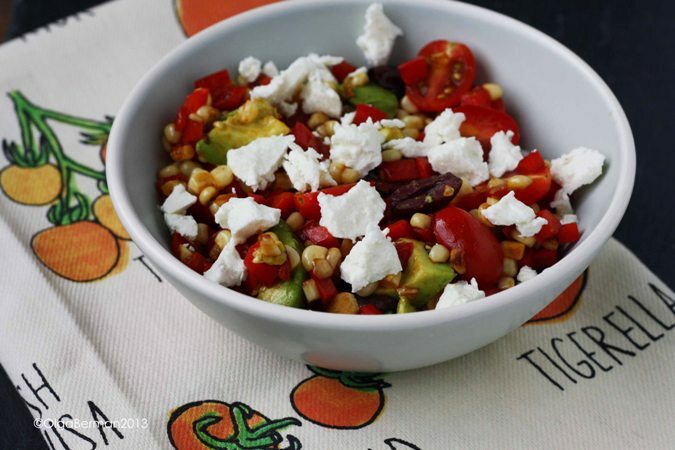 Go ahead, make this Sauteed Corn & Red Pepper Salad with Avocado, Olives & Goat Cheese and see if you don't become addicted to it. 1. 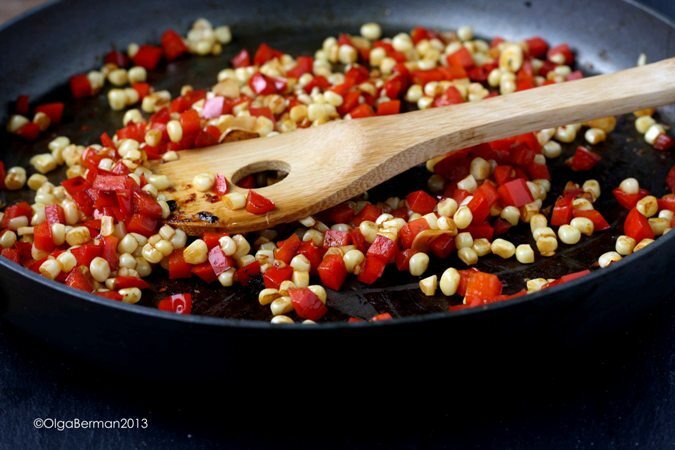 Heat the olive oil in a skillet, add corn, red pepper and garlic. Season with salt and red pepper flakes. Saute until the vegetables are golden brown. 2. 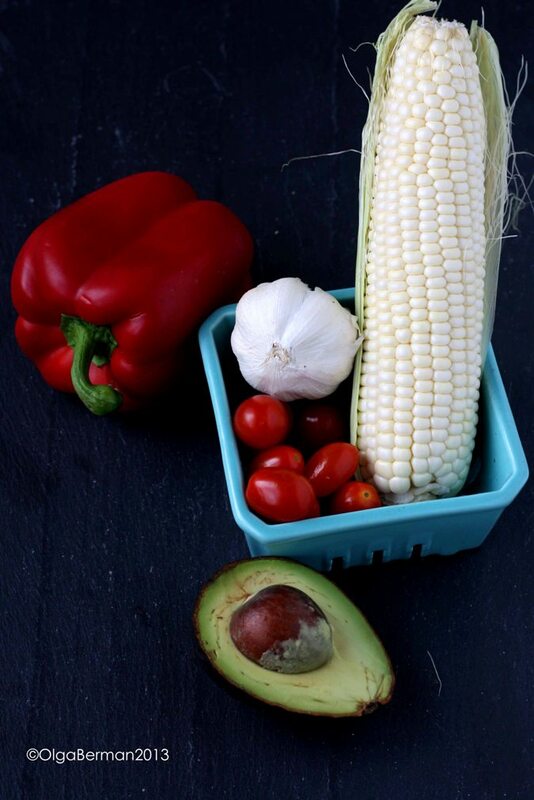 Transfer the sauteed corn, red pepper and garlic to a bowl. Add the rest of the ingredients, except the goat cheese. Taste for salt and add a drizzle of olive oil if needed. 3. Put the salad in a plate and top with the crumbled goat cheese. 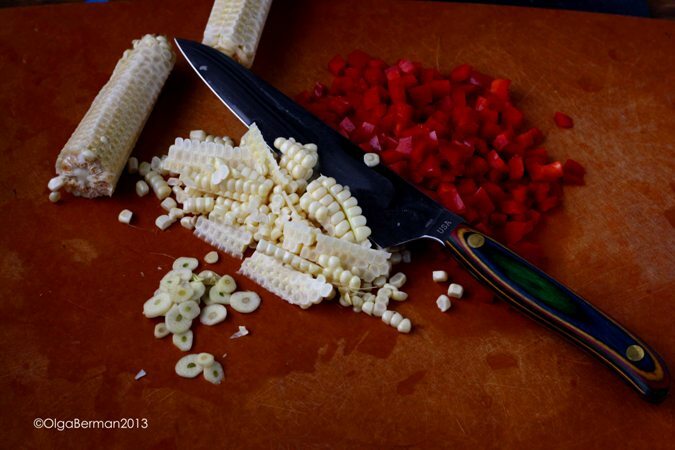 As soon as the goat cheese hits the hot corn and peppers, it will start to melt. This is beyond delicious. 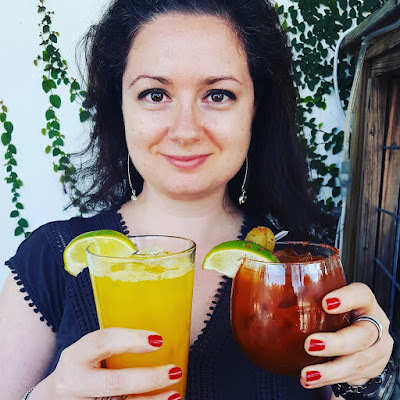 Of course you can use feta or queso fresca instead of the goat cheese. You can also play with different types of olives and spices. I would have added fresh cilantro, basil or parsley to this salad, but alas I did not have any on hand. Go get your fork and dig in! 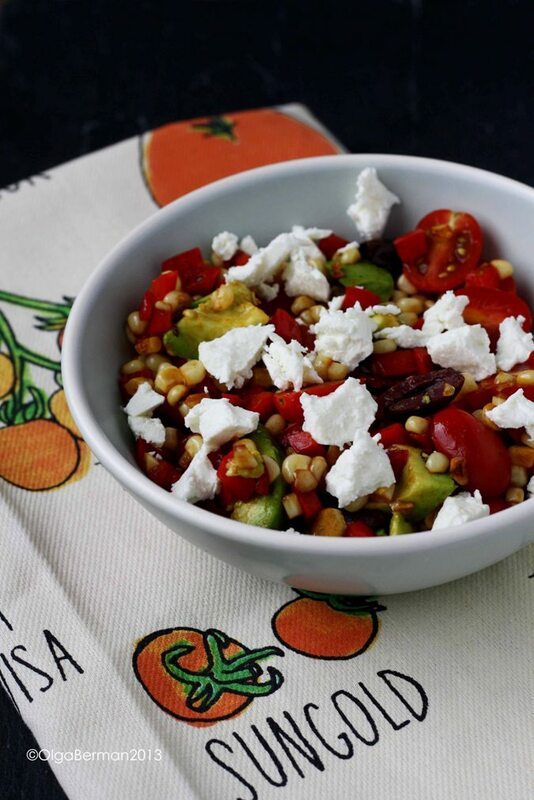 What's your favorite summer salad or side? This is definitely my kind of dinner! 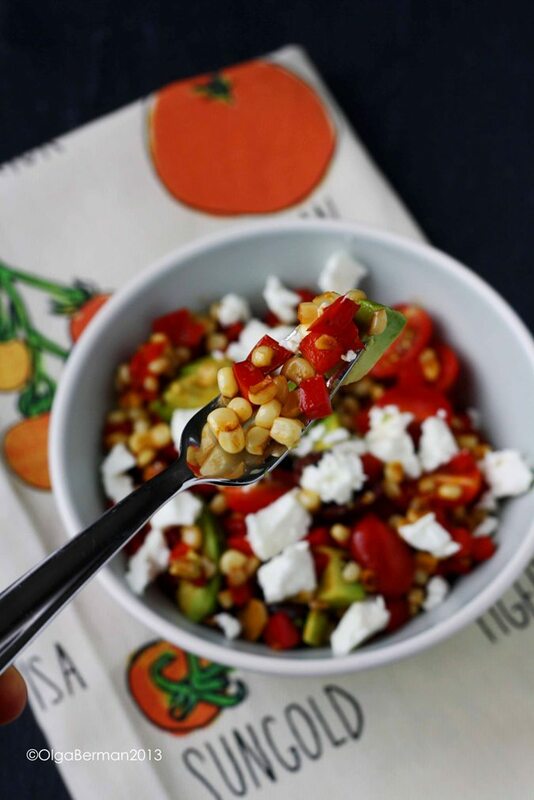 I'm so ready for summer salads like this!